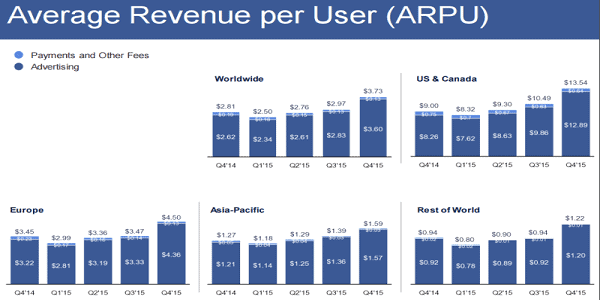 Facebook has announced its earnings for the fourth quarter of 2015. Revenue topped $5.84 billion in Q4, up from $3.85 billion in Q4 of 2014 and ahead of the $5.37 billion that analysts had predicted for the quarter. Earnings per share (Non-GAAP) came in at $0.79, well above the $0.68 expected, and up from $0.54 a year ago. Net income flowed from $701 million in Q4 of 2014 to $1.56 billion in Q4 2015. Advertising revenue, which accounts for the bulk of Facebook’s earnings, came in at $5.6 billion for the quarter; also well ahead of the $5.2 billion that analysts had estimated. Ad revenue grew 57 percent yoy from $3.6 billion. The company saw solid ad growth in all regions, including the US and Canada, which generated over $2.8 billion in ad revenue. Remarkably, the average advertising revenue per user in the US and Canada was reported to be $12.89 in Q4, 15 that is up from $9.86 in the Q3 and $8.26 in Q4, 2014. Overall, ad revenue per user grew to $3.60, up from $2.83 in Q3 and $2.62 in the Q4 2014. Mobile ads continued to account for a greater percentage of the total revenue, reaching to 80 percent of ad revenue in the Q4, compared to 78 percent in Q3. 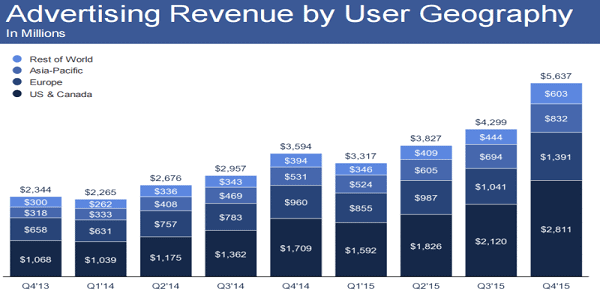 The number of monthly active users only accessing Facebook via mobile also kept on climbing, reaching 823 million in the fourth quarter, up from 727 million in Q3 and 456 million a year ago.